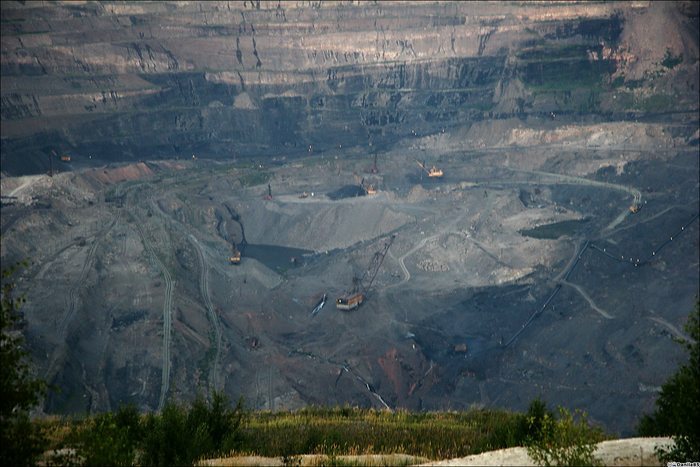 The places on the photos is 2000 ft (700m) deep hole in the ground. 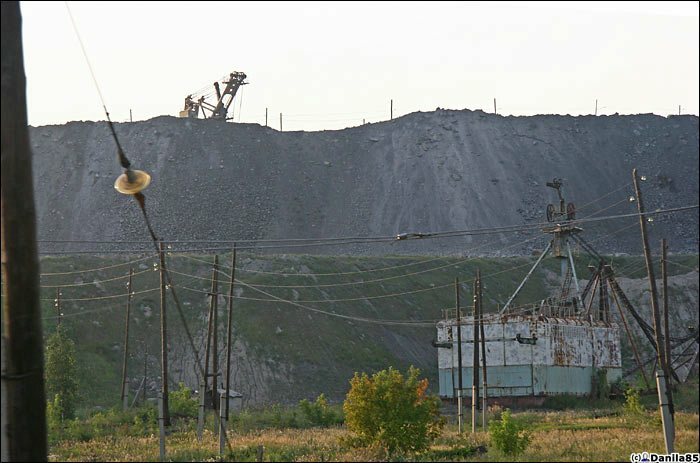 It’s called Korkinsk Coal Mine – the deepest and largest in Europe open coal mine and second largest in the world. Miles of rails, hundreds of electro trains and giant excavators work in this place. That’s probably one of the biggest hand made things on the Earth. This is the sample of such a step. It’s taller than 7 stored building. Those steps go down to the bottom of the mine. And here is the bottom of the 2000ft deep man made hole in the ground. 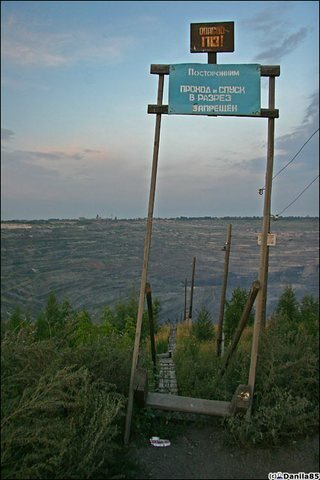 Yes that, Russia, so here we have wooden steps to the bottom of the mine. You can take a walk by this steps for an hour or two to reach the bottom. Or of course you can ask some excavator or electric train driver who carry coal for a free spiral ride down there, they usualy are glad to strangers. 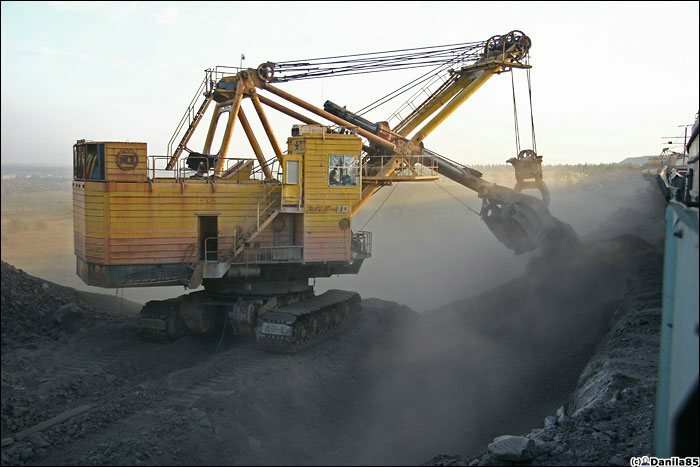 Could it be the Korkinskii Coal Quarry at Korkino, Russia? Does anyone know where you can find that sattelite image of this thing. You can see it from space. 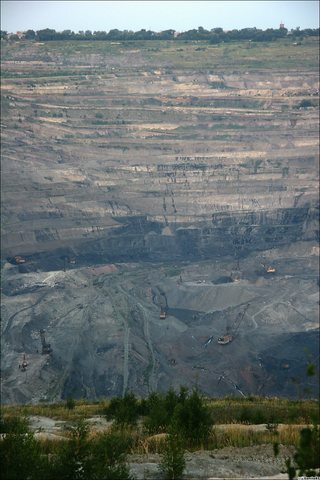 Also there is another image taken from a jet and I believe it shows one of those giant dump trucks heading down in to the mine. 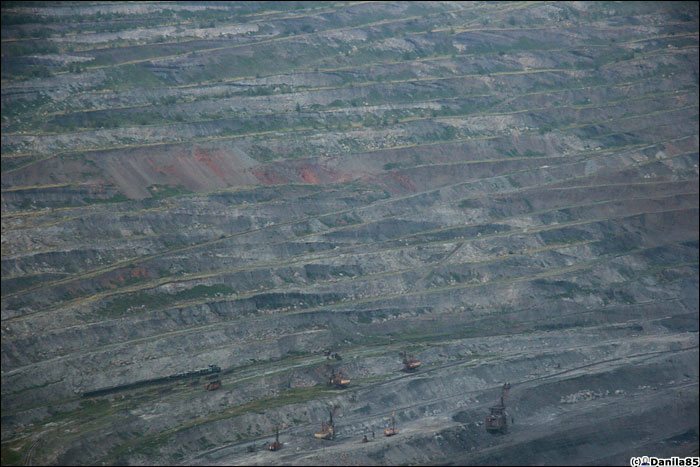 I heard the biggest open-cast mine in the world was in a place called Mirny (or something similar to that name). It too was in Russia. That is amazing. Thanks for sharing those pictures. Pappa, you have enclosed link to Google sat. If you want to see it from space we should light it on fire. Found this page with great pics of the giant hole near Mirna, Siberia. I was THERE in december 2004!!! Korkino is a village or very-very small town near Chelyabinsk city. Actually there’s no problem at all to go and see this really big hole. There’s no police, hired-weres, etc. We just went there by car – the car road is situated just 50 metres from this hole. It’s really impessive. And near this hole there’s a big mountain of ground, excavated from this hole. Korkino is a VERY bad place to live in. 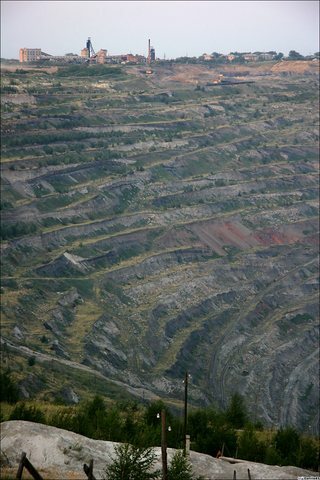 LOTs of desease, sickness from this dirty coal mine. Cancer. Children dies a lot! People leave this town. The deepest man made (hand made) dig is the Kimberly Big Hole. 850m deep. About 2550 feet. No, deepest man made dig is Kola superdeep borehole, about 12 kilometers deep. This is unbelievable, what if they drill through to the other side?